One of the books I most enjoyed reading during the Christmas holiday was PD James’ “Death comes to Pemberley.” It’s in some ways a sequel to Jane Austen’s Pride and prejudice, and revives many of the characters from Pride and prejudice and other Austen novels, but given the fact that it’s written by PD James, also involves a corpse. So imagine my surprise when I returned to work in January and the first book I picked up to catalogue was another Jane Austen revival – Old friends and new fancies: an imaginary sequel to the novels of Jane Austen by Sybil G. Brinton, published in 1913. Sybil G. obviously enjoyed herself hugely while writing this book. In a brief note she says that she wrote the book with her friend Edith Barran “for those who, like ourselves, owe to Jane Austen some of the happiest hours of their lives. ” In the opening chapters she gathers up (nearly) all of Jane Austen’s characters and throws them together into the dizzy social whirl of the Bath season. 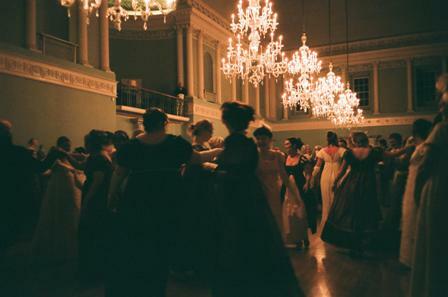 It’s as if she’s involved in a literary game of Consequences: if Elizabeth and Darcy met Lucy Steele and Mary Crawford, in the Assembly rooms at Bath, whatever would happen? Have the characters changed after their novel experiences? Has Lucy Steele seen the error of her ways? Has Mary Crawford been softened and humanized by suffering? Some people haven’t changed a bit: Lady Catherine de Bourgh moves like a tank through the Pump room, destructive as ever. Emma (Woodhouse-that-was) has persuaded her Mr Knightley to go into Parliament and has established herself in town, organizing social circles in London just as she did those in Hartfield. The great thing about using someone’s else’s characters is that you can re-arrange their fate to suit your own preferences. Colonel Brandon was clearly not a favourite with Sybil Brinton, he has been killed off before the story begins. I haven’t yet finished reading this story so I can’t spoil the ending for you, but I can highly recommend it to all the Jane Austen fans. Although I thought I knew Austen’s books pretty well, I was made giddy by the speed with which so many characters appear or are referred to, and luckily there’s an index of characters listed by their original Austen novel.